— and, oh, the joyless mirth those words triggered! But was it actually dull? No! It certainly was not. It was remarkably stimulating. The CDS spoke of our post-SDSR2010 course leading to “a strategically incoherent force structure: exquisite equipment, but insufficient resources to man that equipment or to train on it”, a ‘hollow-force’. And he spoke of our “Royal Navy as being perilously close to its critical mass in man-power terms.” Had he lost the script? Had someone fed him print-outs from this blog? But what is this “exquisite equipment” of which he speaks? 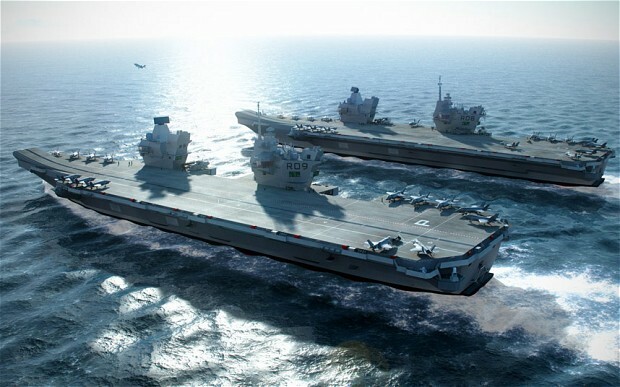 Yes, the new carriers, HMS Queen Elizabeth II and HMS Prince of Wales, plus the Joint Strike Fighter (alias Joint Combat Aircraft, Lightning II, F-35B STOVL) version of the most incredible aircraft programme in history, described in combination as ‘Carrier-Strike’, are his new “exquisite equipment” – a phrase certain to enter the quotation dictionaries. To independent analysts, freed from the subjectivity enforced by MoD or Defence Industry contracts, these fantasies are respectively the MoD’s ‘White Elephants’ and ‘Golden Turkeys’. If, as we believe he must have done, the First Sea Lord has already explained to the CDS that by the time the two carriers are ready to put to sea, they will be too vulnerable to risk in a war zone, he may be wondering what on earth his successors will do with them — which may be one reason he is thinking of asking other government ministries to help fund the cost of Defence. The Department for International Development (DfID) is an obvious candidate for this privilege because it has buckets of money it is desperate to spend in order to meet the Prime Minister’s target of donating seven billion pounds every year, a target annually adjusted upwards. Those readers who remember the Bird and Fortune discussion of the carriers mentioned here last week will doubtless have recognised the solution already. Their flight decks, it was claimed, were big enough to hold 49 tennis courts, the hangars could shelter 12 Olympic-size swimming pools. These are big ships already capable of producing thousands of meals every day, and with hospitals that can be extended into the hangar space to treat many hundreds of sick and injured. The galleys also may be extended to provide thousands of meals for helicopter transport to stricken areas. So the Royal Navy will have two dedicated disaster relief ships ready to help the victims of tsunamis, droughts, famines, earthquakes, and civil wars. They may carry a few V-22 Osprey transport helicopters, a squadron of Chinook utility helicopters, and large numbers of Dragoon utility scout aircraft. And when the UN finds it necessary, they can deploy quick-reaction peacekeeping forces. supply logistic support, and provide a headquarters linked to the world’s capitals. When not leased to the UN for specific disaster relief operations, their acquisition and their training activities would be funded by DfID from the ring-fenced 0.7 per cent of the UK’s GDP, an arrangement that will secure the continuance of an important segment of our naval expertise while also retaining in service many valuable men and women soon to be threatened with redundancy. Of course, the phrase “planned F-35B fleet” is hedged with uncertainty because no one really knows what the plan is now or will be in 2015. There was early talk of “at least” 72 JSFs when we did not yet know if they would be the ‘jump-jet’ F-35B or the much longer range F-35C that needed the carriers to have catapults and arrester wires. Then the F-35B was chosen, and then a little later the F-35C was chosen – and then after that it was back to the F-35B with the change justified in a paper prepared, it was reported, in one afternoon. The numbers were fluctuating in parallel, with talk of two carriers with 6 JSFs each, or one carrier with 12 JSFs and the other carrier in mothballs. All fantasy, of course. Sending a carrier to sea to fight a war with 12 strike aircraft had to be a joke, obviously, hadn’t it? No, it wasn’t a joke. 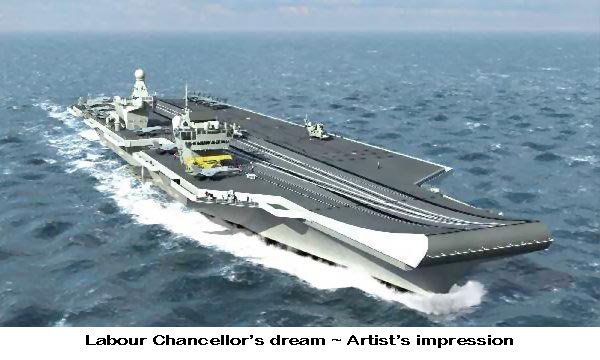 Eventually someone in Whitehall heard the laughter and the provisional decision (or speculation), to be confirmed in 2015, was that there would be 36 JSFs for one carrier, and these could be transferred to the second carrier later, if that was ever completed. Now these 36 JSFs, all of the F-35B version, were projected by the analysts, on the available serviceability and regeneration data, as necessary for the carrier’s CAP, so where were the aircraft for the Government’s promised ‘Carrier-Strike’ capability? The Royal Navy and its incredibly expensive ‘Fifth Generation’ JSFs would be able to attack targets a short distance away from the carrier, or the aircraft would attempt to protect the carrier from such high-flying Mach 2 aircraft as the ‘Fourth Generation’ Su-35s before they launched their missiles, but they would not attack any targets. Yet what targets could the F-35B attack? The munitions in the bomb bay are ‘smart’ – actually very clever – but they are not very powerful. Yes, but this is not important, a Westminster expert explained, because the F-35B is a successor to the Harrier and thus will be used for close air support (CAS) in counterinsurgency (COIN) operations where the Rules of Engagement (RoE) restrict the lethality of our weaponry – ah! that’s alright then! So ‘Carrier-Strike’ will become CAS? There will be many among this blog’s readers who belong to an older generation that remembers pictures of the RAF’s fighter-bombers flying at low level, and very low level, to destroy trains and road convoys in what was then called ‘ground attack’ — and when these aircraft flew similarly to support the troops in direct contact with the enemy, that was CAS. But as a consequence of the never-ending war between the US Army and the US Air Force (more on this later, perhaps next month), CAS has been redefined. 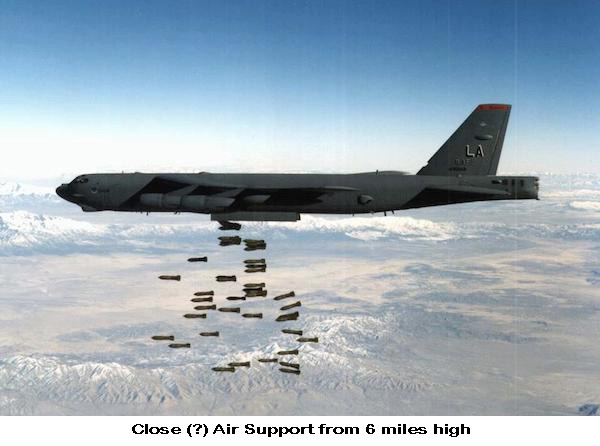 A B-52 dropping its bombs to “support” troops in contact with an enemy six miles below will have its action described as CAS for that reason alone. On such basis, the F-35B JSFs flying “CAS” will not be where British ‘Tommies’ and American ‘grunts’ want them, down in the mud, in touch, working with them from an austere strip — oh, no! At £125,000,000plus each they will be kept very high above anything an insurgent might fire at them. What about the RAF then? The answer to this has been kept very vague, and what has been suggested makes no sense at all, unless ……. Unless what? Well, back in the decade following the Great War the Air Ministry had many different ideas about the bombers we might need (when the men there were dreaming about the fighters which were much more exciting), and thinking about range seems not to have been considered of great importance. If a bomber could reach the military installations and dockyards of northern France, that would be good enough. If we pierce the smoke and mirrors obfuscating the F-35B range data it appears that Brussels may have replaced northern France as the possible target. Is this important? No, of course not, it’s just a sad joke to make a point more memorable, but the MoD is describing the RAF’s use of the F-35B as ‘Deep Strike’ and that is not a joke. It is dishonest, and it repeats a traditional failing that the threatened privatisation of procurement and acquisition will not eliminate. This was explained in this blog a month ago and may be worth rereading. So how do we assess the ‘Golden Turkey’? For the Royal Navy it is being bought at an unaffordable and still unknown price to arm the ‘White Elephants’ for ‘Carrier-Strike’ — for which it has neither the range nor, as a fighter (owing to performance limitations well known seven years ago) the ability to survive combat against potential enemy aircraft already in service. Implicit in ‘Carrier-Strike’ is the need for the carrier to survive, but the F-35B on currently projected performance and in planned numbers cannot operate an effective CAP. For the RAF the F-35B range performance prohibits any form of ‘Deep Strike’ that requires the aircraft to return to friendly territory. All the factors briefly raised here deserve greater exposition, and that will appear here in future months, but it is now perhaps worthwhile to touch on what the F-35B would cost us up-front (a figure that will double during its 30-year life). Remember there are three versions of the JSF — the F-35A ordered by the USAF, the F-35C ordered by both the USN and the USMC, and the F-35B ordered by the USMC only (and the British, of course). The F-35A is the cheapest version and its supposed price tends to be quote airily as if it were a generic price, so that when this is claimed to be $85,000,000 for a single F-35A there is left the impression that the other aircraft will be around that but perhaps a little more. Obviously, a smart politician will ask if the $85,000,000 includes the engine (it does not) and all the other extras an aircraft needs to fly (it does not). That may then encourage him to ask if the $85million is accurate anyway (and it is not). He will be told that it may be more right now, but that the price is decreasing “with the learning curve” (and it is not). Of course, the way in which the costs have been structured allows full use of smoke and mirrors. Example? Right, here is one of many. The early spreadsheets included figures for maintenance labour costs through the years and decades of production, and with these was included a speculative annual percentage increase – a guess, obviously, when trying to predict figures over a quarter-century. Now watch closely. Take this guess and reduce it by, say, 0.1 per cent, and the predicted unit cost of the aircraft will decrease. Wow! So you see Senator, Secretary, General, Admiral, the price is coming down, just as we predicted the learning curve will affect it. 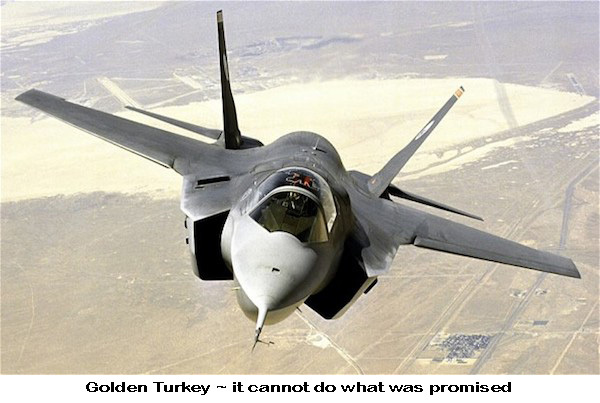 This £125,000,000 ‘Golden Turkey’ is one element of the CDS’s “exquisite equipment.” Who believes we can afford it?